Why Kansan's Call The Arkansas River The Ar-Kansas? AND WHY DO PEOPLE FROM THAT STATE CALL THEMSELVES ARKANSANS??? I could never figure out where they got the pronunciation of the state of Arkansas. When asked why Kansans' pronounce Arkansas as Ar-Kansas I have an answer that usually brings smiles, but one that I take very seriously. That answer is, "because I don't live in Kan-Saw". During the winter of 2000 I told some people from Arkansas who were in Cimarron looking for some tractors my reason. They did not think it was as funny as most people do, however their reply to me was quite surprising. They told me that it made more sense to them than any other thing they had ever heard, and that they could never figure out why the river or their state was pronounced "Ar-Kan-Saw". I went on to tell them the theory that was taught to me while I attended grade school here in Cimarron. Originally there were many tribes of Indians that roamed the great plains in the area of present-day Kansas. The prominent Indian tribe was called the "Kanza" Indians. When it was time for the territory to be named, it was named Kansas after the Kanza Indians. The river going through the Kansas Territory was named by combining the territory's name and a very peculiar feature of the river. Starting in the present southwest Kansas area around Ford KS and going northeast from there, the river started making a great "arc"* away from its easterly path. The present-day city of Great Bend now sits where the river made its turn back to the southeast. The river proceeded southeast to an almost straight line position from the river's original path, about 125 miles east of Ford where the city of Wichita sits today. If the river had continued its path from Ford on to the east instead of its real path to the northeast, it would have bi-passed the present day Wichita location. In theory however, Wichita would still have been on the river as it would have been built somewhere on the river, and Great Bend and Hutchinson would be south, but still on the river more than likely, depending of whether they were built near a water supply or along a railroad route. At the same time, the name Great Bend would not have been used and the name of the river would not be the Arkansas due to no "Arc" in the river. It also would not be the Kansas river as there is already a Kansas river. Wouldn't it be funny if Arkansas was named differently, still after the same river, but a different name altogether? 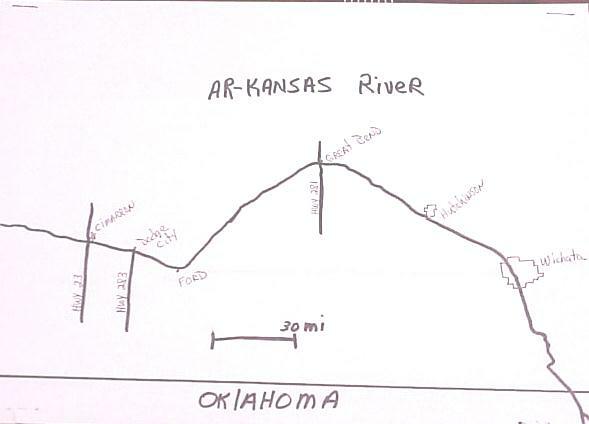 Perhaps the river would have been the Kanza and then Arkansas would be Kanza or Kansaw if they preferred. It would sure take the argument out of the situation. Of course, the state of Arkansas was named for the Ar-kansas river. How the state's name became pronounced "Ar-Kan-Saw" remains a mystery. By, Pete Thomas, webmaster. WHY ARKANSAS THE STATE THINKS IT IS PRONOUNCED ARKANSAW.